2.) 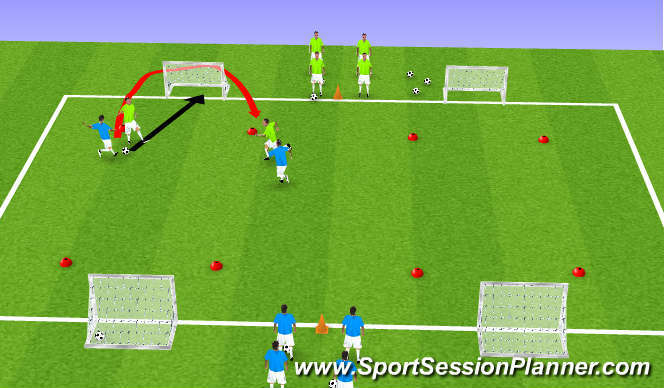 The first player (in green) should dribble unopposed up to any goal and shoot when they get to the red cones. 3.) As soon as the green player shoots the blue player can start dribbling towards any goal. The green player must recover and defend against the blue player. 4.) Once the blue player has shot they must then become the defender as the next green player goes and so on. 5.) Make it competitive by seeing which team can score the most goals in a certain amount of time to increase the intensity of the session. 2.) Blue&apos;s should be in pairs down one end (between the goals) and the green&apos;s down the other end. 3.) The green pair should start the session off (unopposed) passing between each other and scoring like in the previous exercise. 4.) 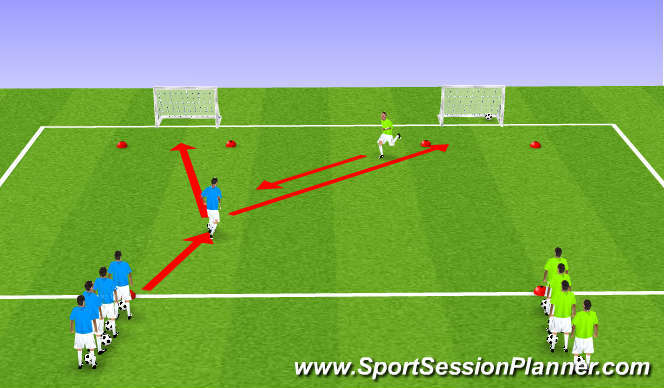 Once the shot is played the player who shot must sprint around the back of the goal they scored in. 5.) While this player runs around the goal the blue team will then begin to attack. It&apos;s up to the remaining green player to delay the attack for their partner to get back and recover. 6.) After the blue team have had their shot the next pair of greens then attack and so on. To increase intensity turn the game into a competition by seeing which team can score the most goals.